1905 Harry Davis and John Harris opened their first movie theater, dubbing it a nickelodeon, in Pittsburgh. 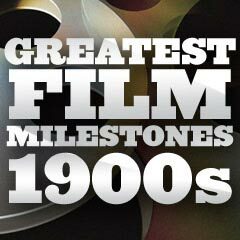 The opening feature was The Great Train Robbery (1903). The name for the converted storefront, dance hall or theater was derived from the cost of admission -- a nickel -- and the Greek word for theater -- "odeon." 1905 The first ever parody of a film was Edwin S. Porter's 12-minute short The Little Train Robbery (1905) - a parody of his own The Great Train Robbery (1903). 1905 Cooper Hewitt mercury lamps made it practical to shoot films indoors without sunlight. 1905 The American entertainment trade journal Variety began publication weekly in New York City. 1905 The short action-oriented British melodrama Rescued by Rover (1905, UK) was produced by Cecil Hepworth, and was the earliest cinematic canine feature. Its star was Rover, a shepherd dog (Rough Collie breed) - the first canine film star. It was a very early and notable example of creative cutting and energetic traveling shots (moving across the screen in a consistent direction) to make it more suspenseful. According to the Guinness Book of World Records, it was also the least expensive movie to produce, at $37.40. However, the 7-minute film was so successful that the negative wore out and the film had to be made all over again. 1905 Director Edwin S. Porter and the Edison Manufacturing Company's family-oriented comedy short The Whole Dam Family and the Dam Dog (1905) was based upon a popular postcard fad of its day, and daringly created humor from the name of the dysfunctional family. It combined live-action comedy and graphics.